The concept of a “fluorescing atmosphere” is generally dismissed as cranky [or just plain crazy] by most pundits and commentators. 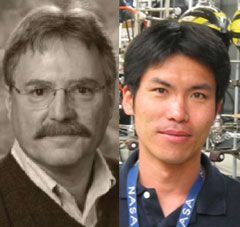 Therefore, I am extremely grateful to Professor Mark A. Smith and Hiroshi Imanaka for publishing a truly remarkable paper on the Geochemical Society website that clearly illustrates that photons are produced in the atmosphere. a) Electrons colliding with atomic gas particles. b) Solar photon colliding with atomic gas particles. c) Atomic gas particles recombining to form molecules. Though less is directly known regarding the haze layers, lying predominantly below the direct reach of Cassini, much is now known regarding the atmosphere above the haze. Using the Ion-Neutral Mass Spectrometer (INMS) on Cassini, we now know that even in the ionosphere, there is a rich and complex organic chemistry unparalleled in any known atmosphere (Waite, 2005; Waite, 2009). Using the Cassini Plasma Spectrometer (CAPS) originally designed to measure properties of the small ions and free electrons in the magnetosphere of Saturn, it has discovered that at the highest altitudes of the Titan atmosphere there exist surprising concentrations of very large charged particles, now believed to be the chemical seeds of the Titan haze (Coates 2007). 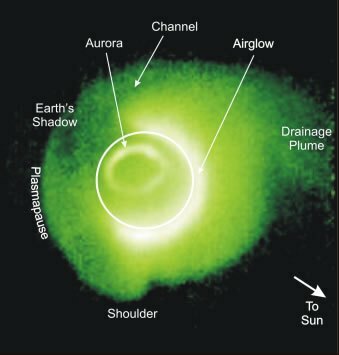 Chemistry at these levels is driven by the solar extreme ultraviolet radiation (EUV) below 150 nanometers (nm) as well as the more minor energetic electrons entering the atmosphere guided by the strong saturnian magnetic field, as depicted graphically in Figure 2. The dissociation and ionization of nitrogen and methane leads to a reforming plasma which is now known to produce benzene, formimine and other complex molecules at regions of the atmosphere where on Earth only small atoms, ions and diatomics exist (Imanaka, 2007; Imanaka, 2009). 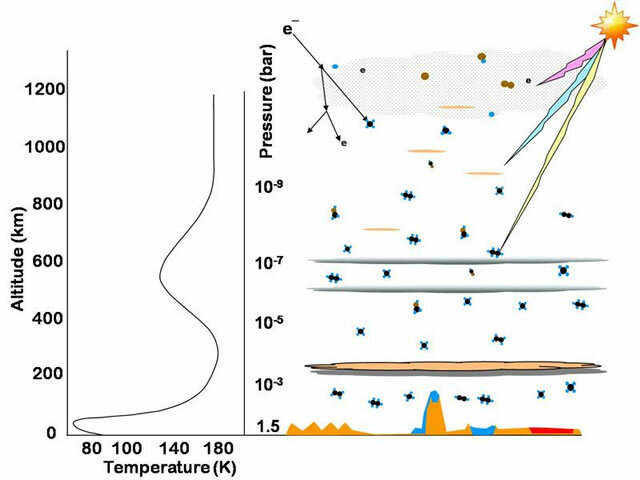 The predominant difference being Titan’s currently reducing methane rich atmosphere, a condition thought to be relevant however during the prebiotic stages of Early Earth. In fact, when one factors in the 100 times lower solar energy flux received by Titan relative to Earth, the resulting lower atmospheric and surface temperatures, and the positive activation energies of much of the complex neutral chemistry required to generate a prebiological chemistry, one can argue that Titan is geochemically reminiscent of Early Earth in its organic chemistry. Mark A. Smith is a professor at the University of Arizona specializing in laboratory measurements of rates and mechanisms for reactions under extreme conditions. Besides his interest in the atmospheres of planets he also works on the understanding of ion-molecule reaction rates at the extremely low temperatures of interstellar clouds and the dynamics of low energy collisions. Hiroshi Imanaka has been focused on the complex organic chemistry in planetary atmospheres and on the surface of icy bodies. He has conducted a novel and advanced laboratory simulation of Titan’s atmospheric chemistry using the vacuum ultraviolet light source at the Advanced Light Source at the Lawrence Berkeley National Laboratory. The fluorescing of Titan’s upper atmosphere is clearly evident. Encircled in purple stratospheric haze, Titan appears as a softly glowing sphere in this colorized image taken one day after Cassini’s first flyby of that moon. 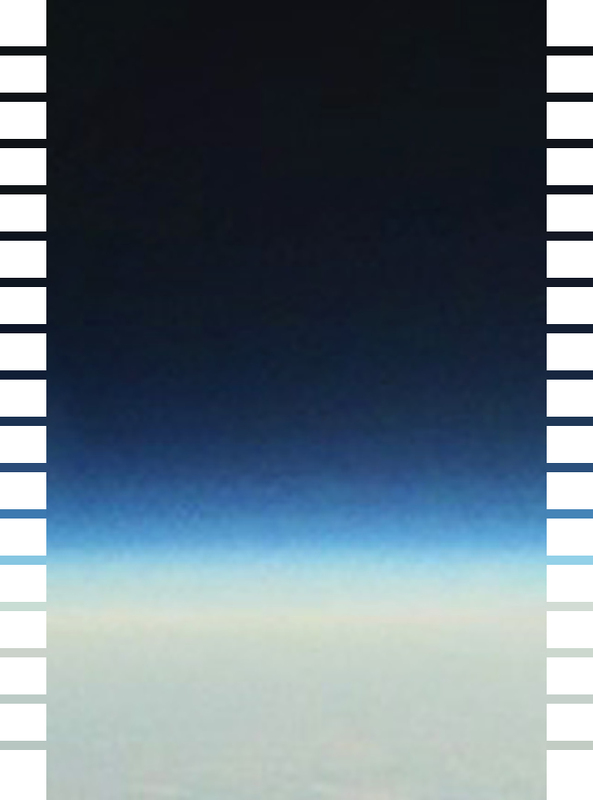 This image shows two thin haze layers. The outer haze layer is detached and appears to float high in the atmosphere. Because of its thinness, the high haze layer is best seen at the moon’s limb. The image was taken using a spectral filter sensitive to wavelengths of ultraviolet light centered at 338 nanometers. The image has been falsely colored: The globe of Titan retains the pale orange hue our eyes usually see, and both the main atmospheric haze and the thin detached layer have been brightened and given a purple color to enhance their visibility. 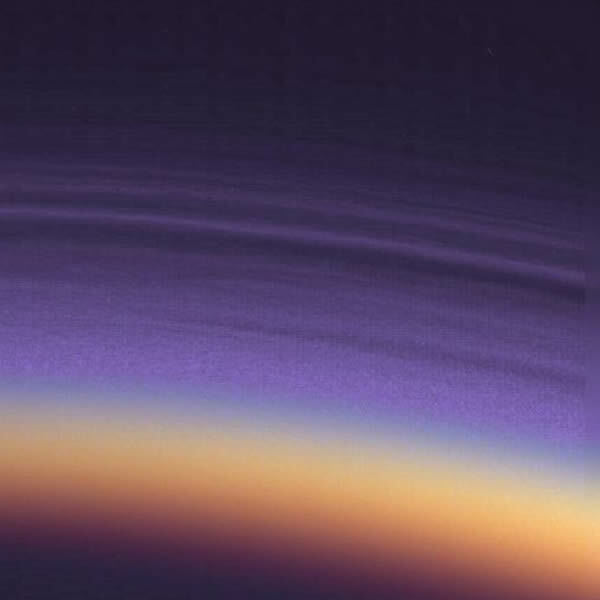 Although NASA is keen to promote the misdirection that the fluorescence [above 400 kilometres] is associated with “methane and nitrogen molecules” or that the atmosphere “preferentially scatters blue and ultraviolet wavelengths of light” the reader should be under no illusions that hydrogen is dominant in Titan’s exosphere and that it fluoresces. ENA smoothed image of Titan’s exosphere obtained by MIMI/INCA during the Ta Titan flyby, on the 26 October 2004. The image was obtained at an altitude of approximately 8000?km with 8?min exposure time and is for hydrogen ENAs between 20 and 50?keV. The colour scale gives the ENA flux. 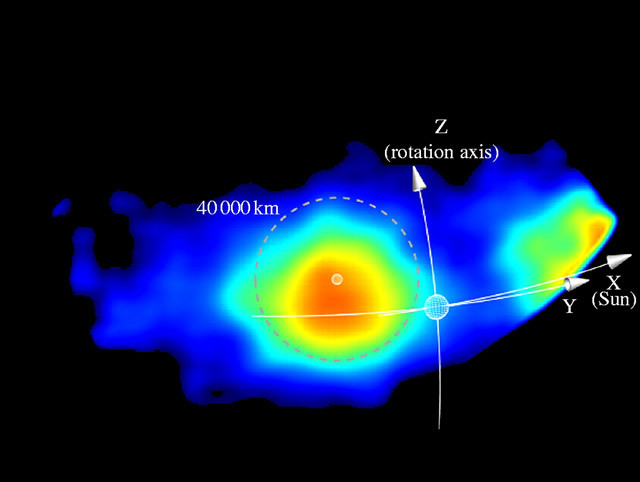 Hydrogen ENA smoothed image of Titan’s extended exosphere obtained by MIMI/INCA during the Tb flyby (13 December 2004), in the 20–50?keV energy range. Saturn is at the centre of the coordinate axes. The dashed circle around Titan represents the 40?000?km altitude sphere. The similarities with the Earth are very striking – although it should be noted that beneath the outer hydrogen layer [in the Earth’s exosphere] is a layer of Helium in the plasmasphere. The Apollo 16 mission carried a U.S. Navy ultraviolet camera that observed the stars and also produced this striking photo (far left) of hydrogen in the plasmasphere around the Earth. 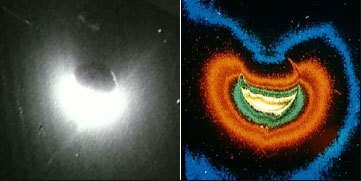 It was colorized (left) to show brightness variations. Earth’s plasmasphere at 30.4 nm. 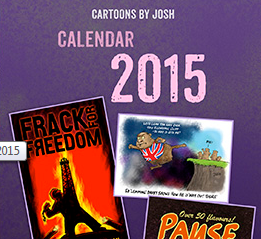 The obvious question is: without living organisms, where are the hydrocarbons coming from? And the secondary: could such a process also occur on Earth? Great find, Rog, and more evidence in support of Miles Mathis conjecture that all matter from the electron upwards recycles the photon charge field. We need to consider the energy contained in the full spectrum of EM emissions to be able to understand climate. could such a process also occur on Earth? Arie Gilat and Alexander Vol: Primordial hydrogen-helium degassing. ‘the exothermic outgassing hypothesis’ is certainly interesting as a way of accounting for the volume of gas, oil and other hydrocarbons in the world. Rotting forests and dinosaur corpses always sounds a bit suspect somehow. Why couldn’t those fossil traces just get absorbed into the mix on its way to the surface? Oldbrew, there are many possible routes for abiotic hydrocarbon formation within the Earth’s mantle: http://tinyurl.com/bq7djzy Unfortunately, there is not a great deal of funding going into such research due to the obsession with global warming. However, the work that has been done suggests that standard organic chemistry theory is consistent with observations and experiment. The arguments have largely changed from whether the processes exist to to rate at which hydrocarbons are produced – i.e. typical green spin. Experiments suggest processes can be very rapid particularly for the smaller molecules but probably longer time scales for larger chains. It is interesting to see the apparent “structure” in the Titan haze. The interactions of solar emissions of all types with atmospheres are not well understood and clearly highly complex. How much effect do these have on climate of the associated bodies? The arguments have largely changed from whether the processes exist to to rate at which hydrocarbons are produced – i.e. typical green spin. Experiments suggest processes can be very rapid particularly for the smaller molecules but probably longer time scales for larger chains. Thank you for the link and the update. My personal observation is that the persistence of vast surface reservoirs of volatile water on the Earth’s surface and the persistent flow of volatile compounds [natural gas vents, petroleum seeps, tar pits] to the Earth’s surface required constant replenishment [because they are volatile] from subsurface reservoirs of volatile compounds that are fed by natural abiotic processes within the Earth. Therefore, I find the Arie Gilat and Alexander Vol hypothesis very interesting [but not perfect] because it includes the two key ingredients [hydrogen and heat] that can drive the natural synthesis of both water and hydrocarbons [on Earth and other planets]. We need to consider the energy contained in the full spectrum of EM emissions to be able to understand climate. The interactions of solar emissions of all types with atmospheres are not well understood and clearly highly complex. How much effect do these have on climate of the associated bodies? That is the great unknown [which the mainstream wants to ignore]. However, a sensible starting point might be to assume that any observed “excess heat” emitted by a planet’s atmosphere [over and above that derived from the incident Total Solar Irradiance] is driven by the injection of ionised particles. This “excess heat” is currently [and incorrectly] labelled the “greenhouse effect” by the mainstream.